As I have said before, I view fashion mostly from a 'Would I wear it?' 'Do I want it?' perspective, and resort collections are of course fabulous for this. I love the following three collections and had to restrain myself from posting more pieces, especially Roberto Cavalli and Elie Tahari oh lovely. Cavalli: Love the mix of prints extending to the shoes, with the lovely jacket. This dress is so easy and glamorous and the colours of the print remind me of a lovely garden in the sunshine. I really like the sweater/t-shirt maxi skirt trend, the necklace can really elevate the look as well. And for Tahari... I want this suit. This dress, simple, loose, interesting print - it's like a long t-shirt and that's great. This dress is so pretty and the shape would be flattering on so many women. His clothes are so great for so many body shapes and I love that! I want this shirt-dress so bad, and with the jacket, so effortless and chic. 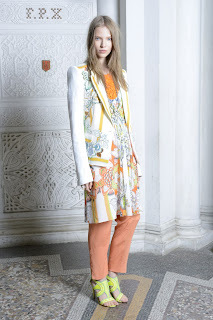 Lastly for this post, Tory Burch had, as usual, an excellent use of prints. Here is a maxi skirt with t-shirt look I love... don't need a necklace here since there is so much going on, especially with the tiered skirt, which is so lovely. And this trench cut off at the waist is amazing.